Chris starts the show telling us how much he’s enjoying his Acer A30 tablet. It’s not something that’s wildly different from an Android standpoint, but the size and ease of use seems to be key for him. We’ve talked about Chromebooks off and on over the previous episodes. These devices are getting more and more popular in the consumer space. According to reports, consumers are now more ready to compute in the cloud. We discuss how the hardware is decent and functional. Most of the things you’d like to do on a laptop, you’re going to be able to do on a Chromebook. Considering most average consumers just use computers to check social media and email. What do you see out in the wild? Typically you’ll see more Macbooks, Tablets and PC’s, but with 25% of the computing market captured, this may change. 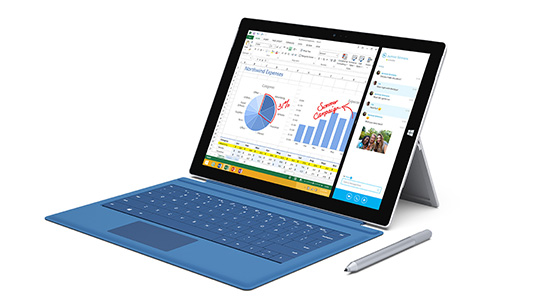 With that said, the Microsoft Surface Pro 3 was announced this week. This device is slightly larger having a 12-inch display, but yet it’s still light weight. Additional configuration options are available starting at $799. The device looks like it can be strong in the enterprise and salesforce of the world. Google Drive has captured the title of consumer cloud champion by “revolutionizing consumer and small-business cloud beyond recognition.” Maybe Google has. I don’t know as revolutionizing is a such a strong word. We discuss daily use cases for Google Drive for storage, Google Docs for online documents as well as Sheets and GMail. Most of the panel on this week’s show has a lot of data stored in the cloud with access across multiple devices. And now, cloud storage is getting much cheaper. Think this is the reason more consumers are jumping on board? More on the Verizon XLTE network rolling via CNET. The wireless provider is now ready to do a pilot test at the Indy 500 offering multiple fast data streams with a television streaming option. This sounds great from a performance standpoint, but the catch is how fast do you burn through your monthly data allotment? Chris supposedly has built a “wifi tunnel” allowing him to jump on public wifi access points throughout the day. Sure he understands the security risks, therefore he’s only using it keep off of his data caps. In this week’s “Who Got Hacked” news, Ebay was hacked. If you use Ebay, you need to change your password. Also this affects Paypal users as the information taken from Ebay included Paypal records. Google is rumored to offer WiFi equipment for small-businesses. The hardware would be subsidized of course. Looks like a cool venture by Google for providing more free connectivity, but at what cost? Ads and data trends have to be in the cards I’m sure. Mike ponders why Google would even be in the game of offering equipment when other OEMs are out there with the capability to do this. Larry blogged about more public wifi offerings on his blog. All looks great at first, but when there’s no competition in the ISP game, we as consumers will be stuck with paying premium rates for our bandwidth. We looked at our own personal usage and discussed how we’d really be in trouble with usage costs. We are all heavy internet users. Thanks for checking out the show. The comments, +1’s, likes and all of that social media stuff is GREATLY appreciated. Keep spreading the YATS love to your social connections and be sure to connect with us in the Yet Another Tech Show community. Check out our crew and connect with us. Thanks, yall.